Personality disorders are a psychological condition in which a person displays patterns of behavior over their lifetime that cause significant interpersonal issues, conflicts with work, and maladaption to social situations. Personality disorders range in severity, but many are serious enough to prevent a person from being able to perform work-related functions. If you or someone you love is in need of Social Security benefits for a personality disorder, the Indiana long-term disability attorneys of Hankey Law Office, can help you. The process of applying for and receiving Social Security may seem difficult, but we are dedicated to helping our clients to obtain the benefits that they need. Contact us today at (800) 520-3633. These conditions must be accompanied by significant social difficulties, struggles with daily living, and inability to sustain concentration. Dealing with a personality disorder can be extremely difficult and the effect it has on the ability to maintain a living wage is even more stressful. At Hankey Law Office, our Indiana long-term disability attorneys are committed to helping individuals with disabilities obtain the benefits they need. 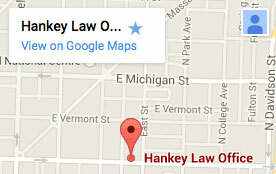 Contact us today at Hankey Law Office.